​The Signet 9900-1BC Batch Controller system provides control capability and process fine-tuning in a familiar package. The programming interface uses a four-button keypad and an intuitive menu for adjusting a batching system to the best performance possible. Choose between simple or advanced modes. In simple mode, relay outputs can be used for batching, external counter, missing signal alarm and 4 to 20 mA output can be used to indicate batch status. In advanced mode relays can also be used for end of batch pulse, two-stage shutdown, overrun alarm, high flow detection, total volume or source volume alarm. New to Generation IV, Automatic Overrun Compensation feature. The 9900-1BC can measure excess flow after a batch stops and use it to reduce flow to the next batch by de-energising the batch relay early, thus closing the flow control valve, and eliminating batch overrun. Designed for a variety of batch applications, the 9900-1BC can save up to 10 batch sizes for batching or blending a variety of liquid volumes. Customise batch names for easy distinction between batches. One K-Factor can be used for all batches, or use a different K-Factor for each batch for when different liquids are batched. User can choose to be prompted prior to starting a batch with a Yes | No or with a password to prevent inadvertently starting a batch. New! Automatic Overrun Compensation can eliminate excess flow by automatically reducing the next batch size by the overrun value of previous batch. If your organisation requires five or more 9900 Batch Controller units, please contact our team of experts for a quotation. The Signet 9900-1BC Batch Controller system provides control capability and process fine-tuning in a familiar package. 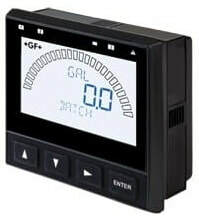 The programming interface uses a four-button keypad and an intuitive menu for adjusting a batching system to the best performance possible.